I’m enormously (unfortunate choice of word) fond of cheese. I can scarf a large wedge at one sitting, even after a hefty (there I go again) meal. 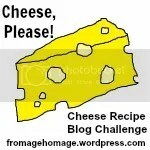 One of my favourite food bloggers, the witty and always interesting author of Fromage Homage, publishes a monthly challenge for fellow turophiles. November’s challenge is for recipes with smoked cheese. Apparently you get additional points for smoking your own cheese using a tin can and a soldering iron while wearing a ridiculous cardigan. Ignoring the faint possibility that FromHom wasn’t being entirely serious, I started rummaging through fridge, cupboards and wardrobe. As usual I found myself improvising because I lacked the right ingredients. 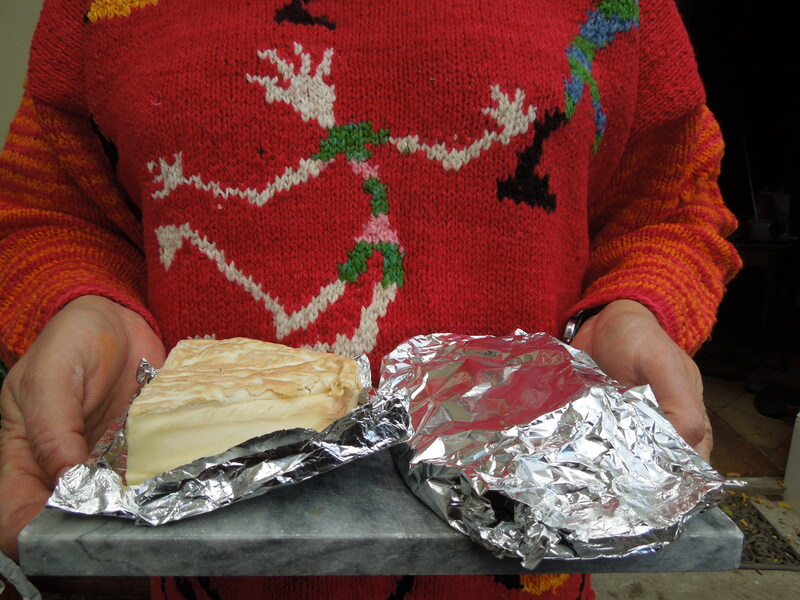 I had the cheese – but no soldering iron and no suitable cardie. So I put on my most garish jumper. Sorry, it’s a bit moth-eaten. Then I used a small metal smoker bequeathed by my mother-in-law. It’s powered by methylated spirit. Oh stop with the jokes already. 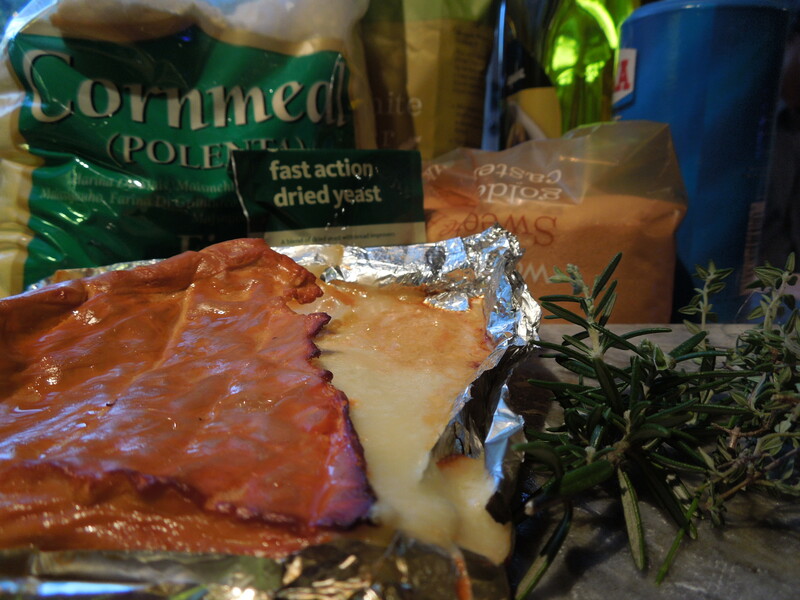 I hope to make up for these failings by posting not one, but two, smoked cheese recipes. 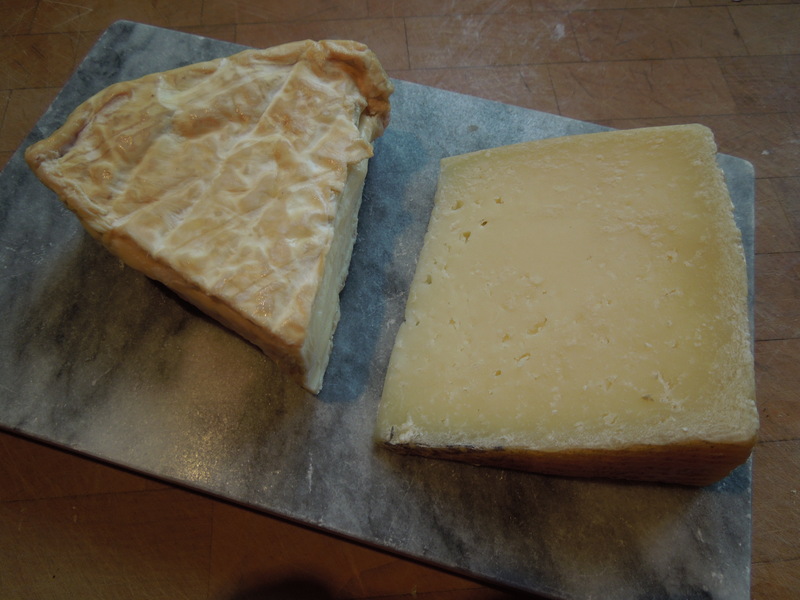 Of course you can make both of these recipes with unsmoked cheese but it does add a different dimension. The first is made with Norfolk White Lady, a soft Brie-style ewes’ milk cheese, which comes from Willow Farm Dairy near Wymondham. It won Silver at the British Cheese Awards, it’s one of my favourite East Anglian cheeses and it’s almost certainly a culinary crime to smoke it. 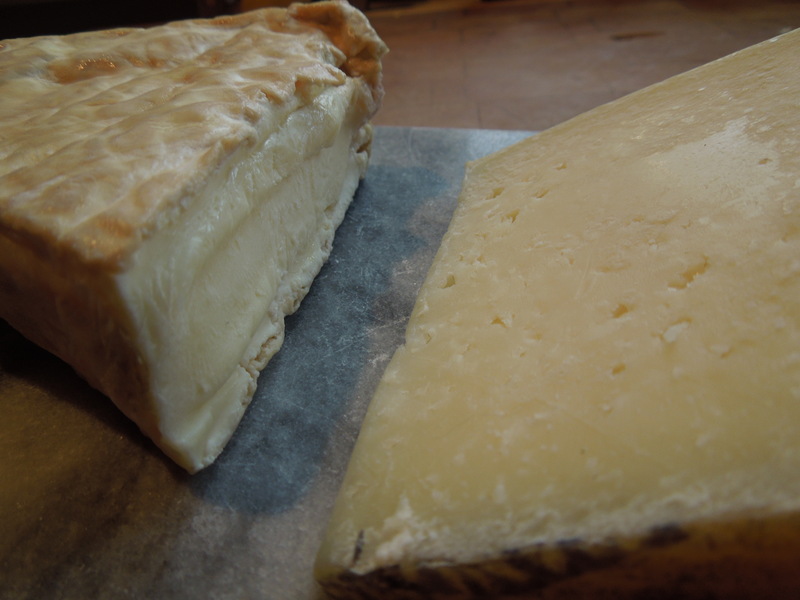 The second uses another sheeps’ milk cheese, the firm and nutty Spanish Manchego. The instruction book for the smoker says you shouldn’t smoke hard, mature cheeses, but I did and it tasted pretty darned good. 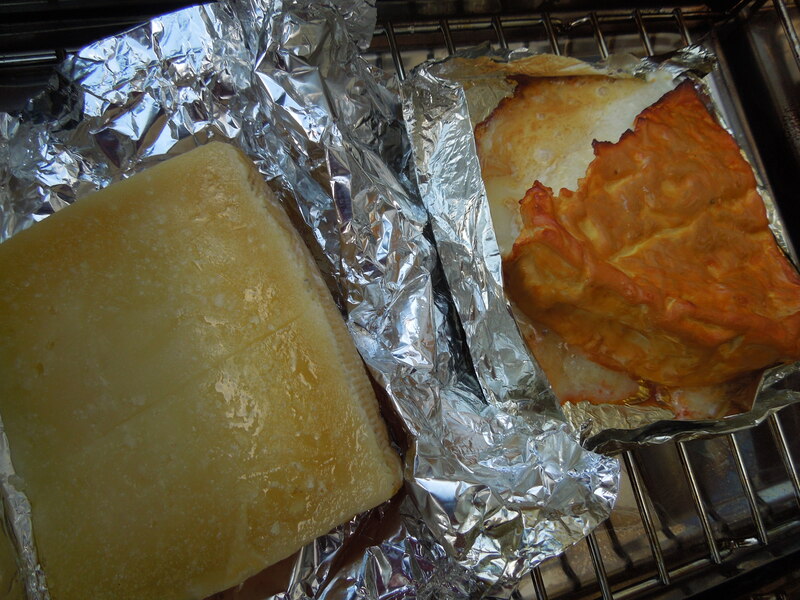 Both hard and soft cheeses were hot smoked for just 10 minutes over maple wood shavings. I wrapped the Manchego in foil to stop it drying out too much; it came out lightly smoked. 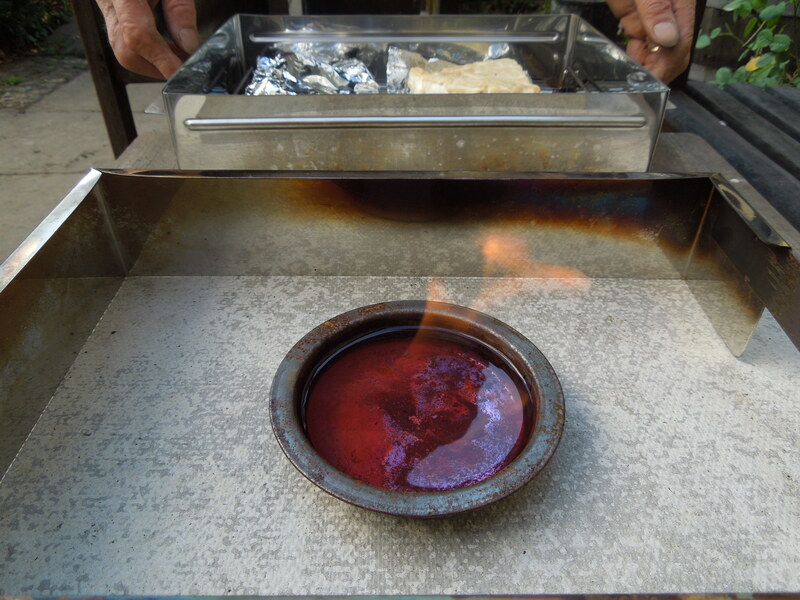 The White Lady was smokier and meltier because it sat in a foil “boat”. 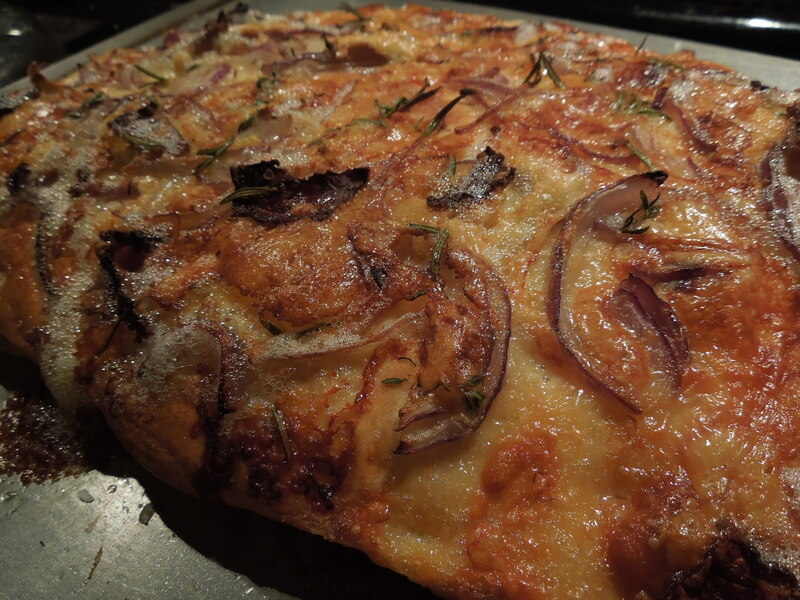 I thought I’d better use the White Lady quickly so made this focaccia. It’s based on one from Jamie Oliver but I messed around with the toppings. They’re red, white and green like the Italian flag. Well, they are before you cook them. Mix the yeast and sugar with the lukewarm water and mix well with a fork. Put the flours and salt in a large bowl, making a well in the middle. When the yeast/water mix starts to foam (a few minutes, hopefully), slowly pour it into the well in the flour, mixing with a fork as you go. When the ingredients have come together – get your hands in there – turn it onto a board and knead well for about 10 minutes until you have a smooth, springy dough. Lightly oil a large bowl and put the dough in it, sprinkling with a little more flour. Cover with a tea towel and leave to stand in a warm place for 30-60 minutes until the dough has doubled in size. While the dough is rising, preheat your oven to 220C/425F/Gas Mark 7. 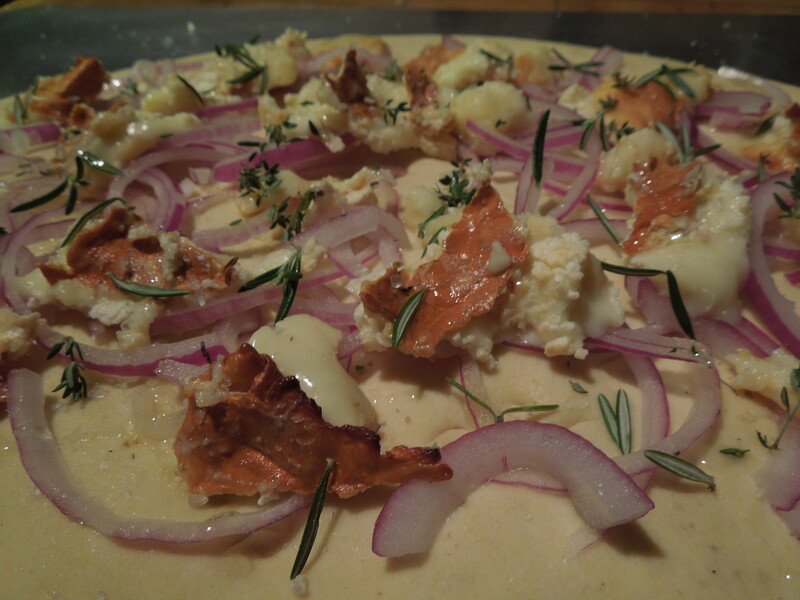 When the dough has risen, knock it back, then place on a lightly-oiled baking sheet and spread it out to cover the tray. This is easier said than done as it’s very springy. I ended up using a rolling pin. It’s pretty robust stuff. Make lots of dips and wells by pushing on the dough roughly with your fingers as if, Jamie says, you are playing a piano. Mine was a bit honky-tonk. Scatter the sliced onion over the top. Dot with bits of White Lady cheese and scatter over the herbs. Finish with a good drizzle of olive oil and sprinkle with a little crunchy sea salt. Leave to prove for a further 20-30 minutes, then bake for 20 minutes, until golden on top and soft in the middle. This makes a good lunch or supper paired with a soup but it’s irresistible on its own fresh from the oven. Savoury, springy, subtly smoky. As I’ve mentioned before, I subscribe to the Katie Stewart method of baking quiche. 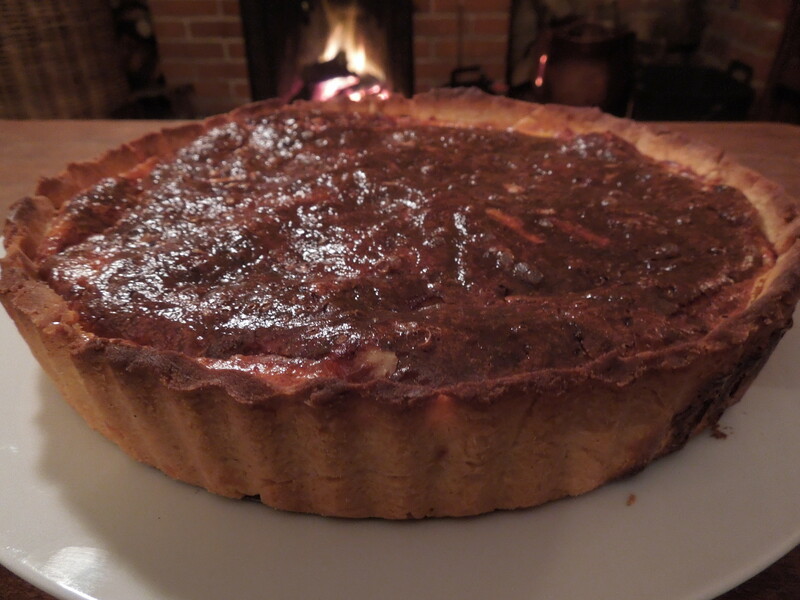 She used self-raising flour and put the flan tin onto a pre-heated baking sheet, thereby avoiding a Soggy Bottom without going to the trouble of blind-baking the tart shell. Sift the flour and salt into a mixing bowl or into your food processor. If working by hand, cut the fats into the flour in cubes and rub it in with the tips of your fingers until the mix looks like fine breadcrumbs. Or give it all a quick whizz in the processor. Add two tablespoons of water and mix until the dough clings together. Add another tablespoonful if it still looks crumbly. 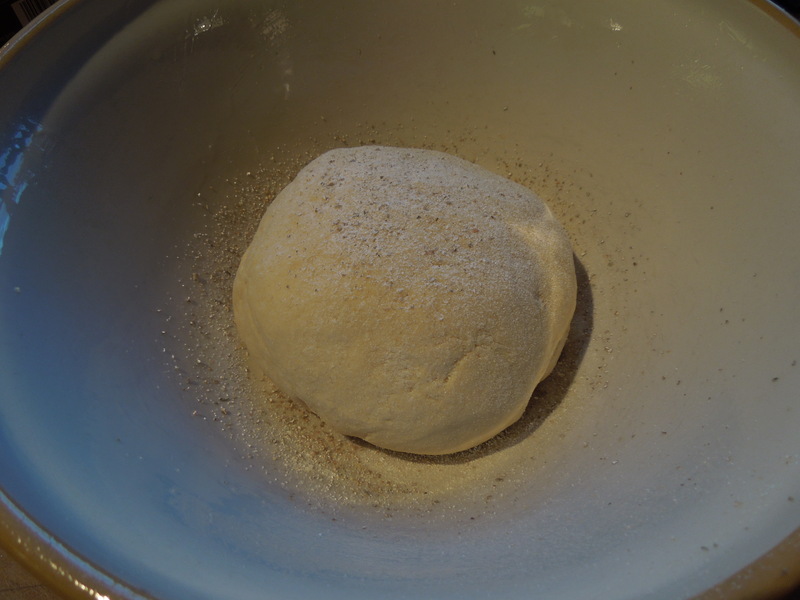 Remove from bowl, turn onto a lightly floured surface and knead once or twice to remove the cracks. Wrap in cling film and chill for about half an hour. Remove the pastry from the fridge 15 minutes before you want to use it so it rolls easily. Heat the oven to 375F/190F/Gas 5. Put in a baking tray to heat up. Roll out the pastry on a floured surface and use to line a greased 8″ (20cm) loose-bottomed flan ring, preferably a deep one. Leave a bit of an overhang at the top to combat shrinkage in the fridge and chill the pastry again while you prepare the filling. 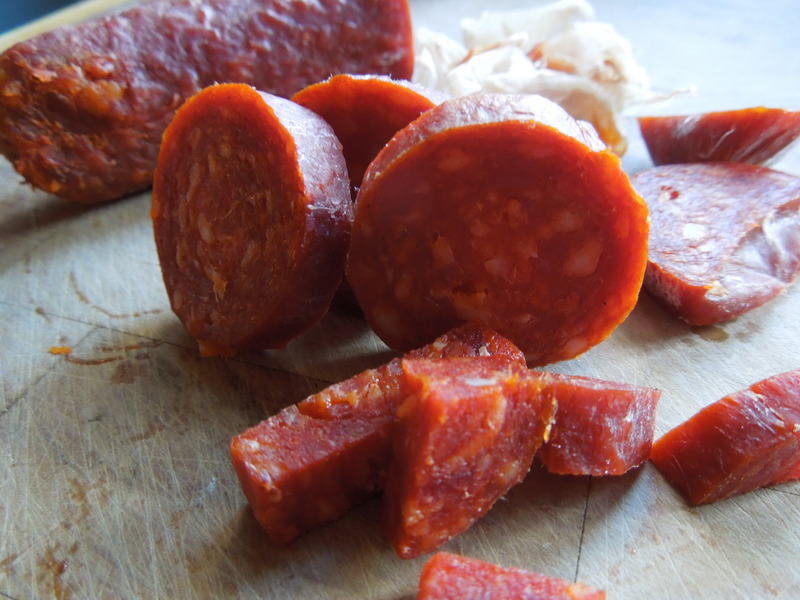 Skin the chorizo and dice (or slice into thin rounds if you’d like it chunkier). Sweat the onion in the butter until soft and golden. Add the garlic and cook for one minute. Remove from pan and set aside to cool. Beat the eggs and cream/milk and season with salt and pepper. 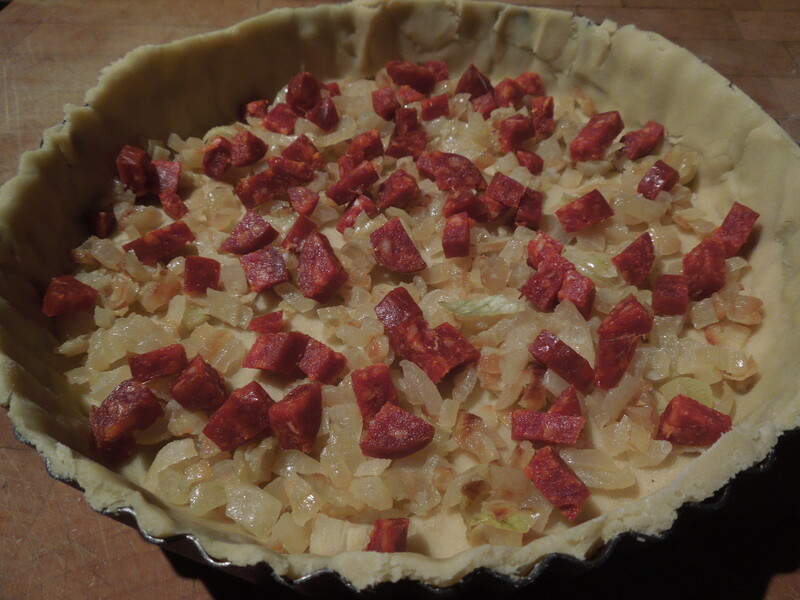 Take your flan case out of the fridge and trim any rough edges then scatter the onion and chorizo evenly across the base. Strew the cheese thickly over the top then carefully pour over your egg mixture. Place on the preheated baking tray in the centre of the oven and cook for approx 40 minutes or until set but still with the faintest of wobbles in the middle. If the filling is still uncooked but the pastry is beginning to catch, fold some kitchen foil into strips and curl them over the top edges of the pastry. Don’t be alarmed if the top goes dark brown, it’s the quantity of cheese. Serve warm. If anyone would like to try the Cheese, Please! Challenge you can find the rules here. Go on, give it a go. You can always skip the home smoking and naff knitwear. 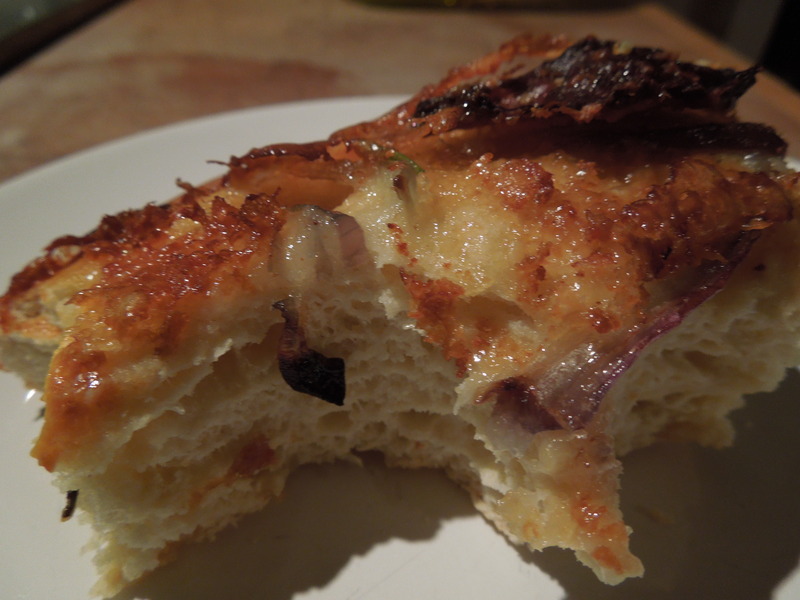 This entry was posted in Breads, Cook books and blogs, Eggs and dairy, Mains, Smoking and curing and tagged cheese-please-challenge, chorizo, focaccia, Manchego, Norfolk White Lady, quiche, smoked cheese by Linda Duffin. Bookmark the permalink. Oh my word, I’m speechless! Obviously at the sight of your knitwear but also at the fact that you HOME-SMOKED not one but TWO cheeses and then knocked up these dishes. Full Brownie points to you. 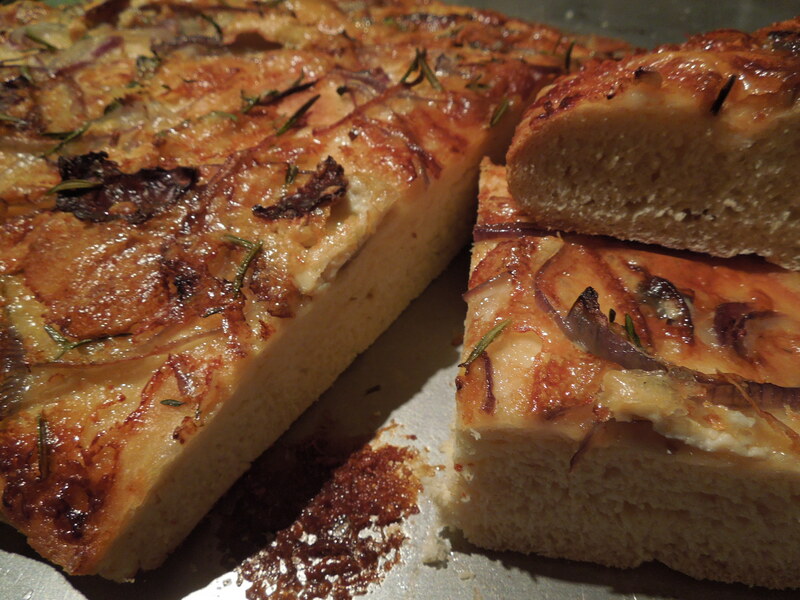 The focaccia looks amazing – I do love a good cheesy focaccia and also tend to rely on good old JO for my recipes. 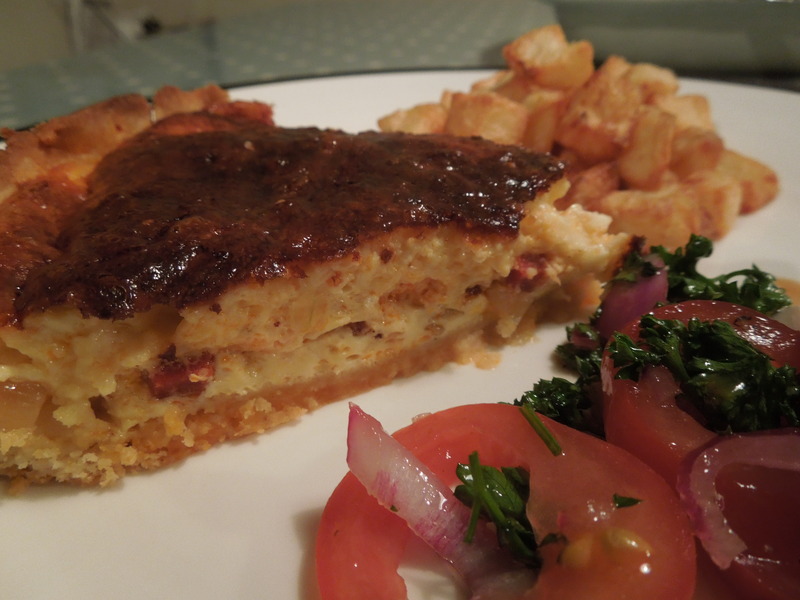 But also the quiche – as a pastry novice, I am very intrigued by your soggy bottom tip. 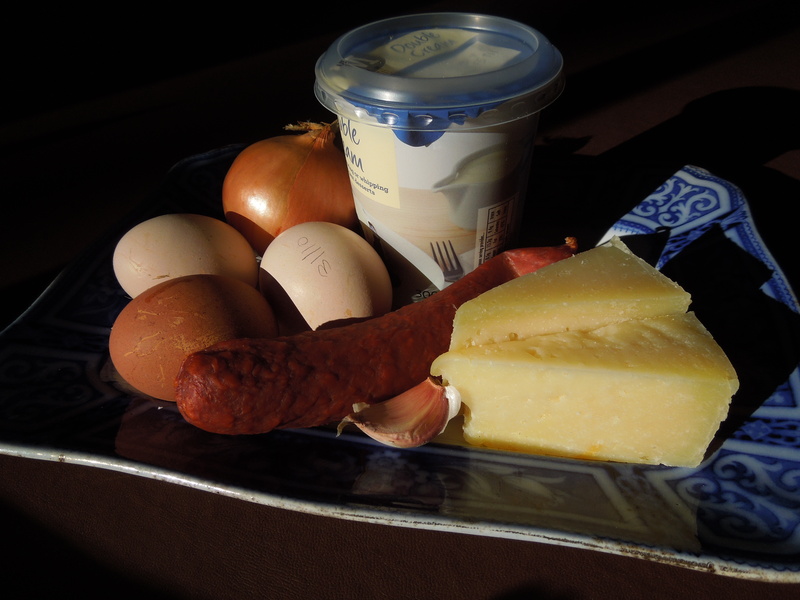 Chorizo and smoked manchego – heaven! Thanks for rising to the Challenge! Now I feel guilty. I have a hot-smoker in the kitchen that I use for all sorts of things, but opted to buy in my smoked cheese this week. Shame on me, well done you. Lovely looking food. Oh phooey,if we took that logic to extremes we’d be milking our own sheep in the back garden! It sounds as though you get much more use out of your smoker (mine’s been used twice in the last decade). Thanks for your kind words though – I look forward to reading more of your recipes.